Tonight I have another new to me brand. Chick Nail Polish. I remember seeing this brand over on Let them have Polish at the end of last year, I remembered the little birdie logo on the bottle. Let's get straight to the polishes. Gavie Green - an aqua blue shimmer in a slightly greener base. This was two coats with top coat. 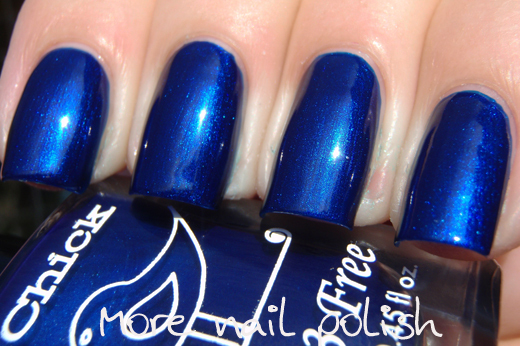 Raven's Egg - This is a deep navy blue with a bright shimmer that comes out to play in the sun. In lower light it looks much darker, more like the last photo. Excellent smooth application. Two coats with top coat. 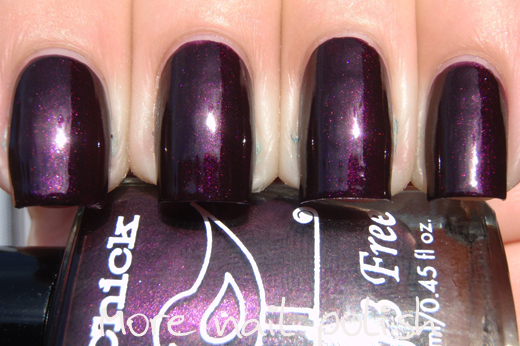 Rocker Chick - a dark rich blood plum with shimmer that reflected both a blue leaning magenta and a copper micro-shimmer. In the sun the shimmer was quite bright, but in the shade it's quite a dark and vampy colour. Two coats with top coat. The formula on all these was beautiful and I'm really loving the last two shades now that the weather is cooling down and I don't go for my bright polishes so much. The dark bases are also perfect for glitter layering. 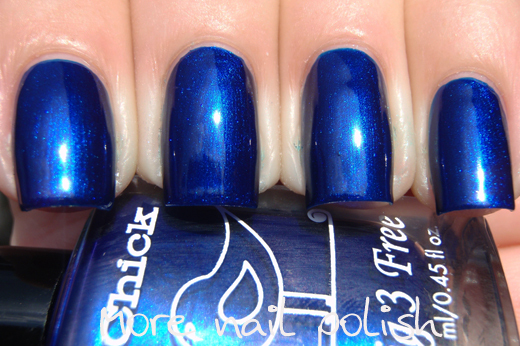 Chick polishes are available from the Chick Polish Website for those in the USA, and us international ladies can get them through Llarowe. Rocker Chick is so beautiful and the name is perfect. Gavie Green and Rocker Chick are stunners! Wow - I love the first one. I have a real weakness for those sort of aqua-greens! I'm gonna have to agree and say Gavie Green looks amazing. It's so pretty and subtly shimmery! Gosh, how pretty! I think my fave has to be Gavie Green though! Thanks for bringing them to my attention, I'd never heard of them before! My, oh my!! Never heard of them before, but OMG so pretty!!! Gavie Green is my fave though, such gorgeous shade!! Is this brand still being made?